As I mentioned in my previous post, my husband and I headed down to Missouri to see the solar eclipse, and brought Eclipse Sky along for the ride. I'll just tell you now, we have no fabulous photos to share, because that requires a good camera and an appropriate filter. We did, however, get peeks through the clouds at the eclipse before, during and after totality, and it was very, very cool to see. 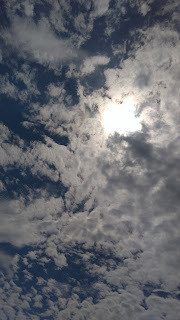 Just after spying some Anne of Green Gables themed fabric, we spotted shadows outside the window, which meant there was a hole in the clouds, so we ran out to go grab the eclipse glasses out of the car (where we had left them because, well, it was raining!). On the way, two lovely quilters offered let us peek through theirs in case the clouds blocked the view again again before we got to the car. Quilters are just plain nice! So here's what the partial eclipse looked like when photographed with a phone camera, without filters, through patchy cloud. Pretty picture, but not much about it says eclipse! I did see the disc with the bite taken out of it through the eclipse glasses though. About 10 minutes before totality, heavier clouds rolled in and blocked our view, and made my husband face fall, because they stretched pretty far and there was no way they were going to pass before totality. We did see the sky turn to twilight though, and street lights came on. This was shortly after 1pm. Away to the east, just clear of the clouds, we saw what hubby has since identified as Saturn becoming visible in the lower light. Look for the white pinprick beside the "Saturn" label in the picture. 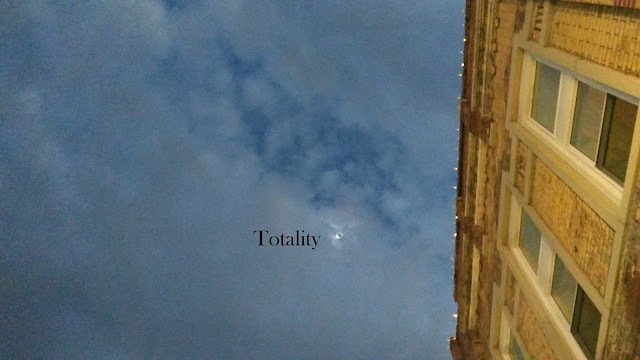 And about 1 minute into totality someone gasped, and everyone looked up again to see the clouds parting just a little. Again, lousy picture but in person it was beautiful, a solid black disc surrounded by a shimmering silvery glow. We watched the rest of totality, about a minute's worth, saw the red beads on the edge as the moon moved on, and a few seconds later the clouds blocked the sun again. Of course, a while later the sky was clear again as we came out of the shops and took a last peek at the moon almost past the sun. I meant to take a closer shot as well, but the social media director at Missouri Star distracted me by rushing up and asking to take a picture, and by the time we finished chatting I forgot to turn around and snap a better picture. She got one though and posted it on their Quilting Deals facebook page. She neglected to use my full name in the post, but Joanne K. is me and that's my quilt :) The post is pretty far down their page by now but I shared it on my Canuck Quilter FB page so I could find it again easily. What about the fabric? 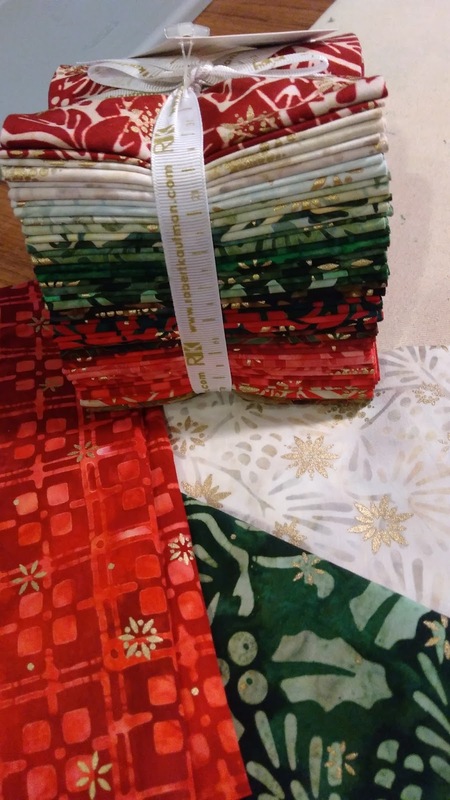 Well, I don't use precuts much, and I'm pretty spoiled with the excellent fabric selection at Quilting Connection, but I found a couple of collections to bring home. Up first, the Anne of Green Gables themed fabric from Penny Rose Fabrics. Not my usual colors, but my daughter and I are both Anne fans. There are quotes on some of the fabrics, and Green Gables on another. I have plans for two scrappy throws (one for Laura, one for me) with a period look. There were charm packs and jelly rolls left, but I didn't want to limit my pattern choices so I asked for 1/4 yard cuts instead. I did the math, and it was much cheaper that way too! I don't think the fellow cutting my fabric was as excited by that or by the fabric's possibilities as me. I suspect he was not a quilter. The girl cutting my fabric in the batik shop was much more lively and interested in fabric possibilities. I think she may be a quilter! I chose a fat quarter bundle and a little extra yardage of Artisan Batiks: Northwoods by Lunn Studios for Robert Kaufman Fabrics. I had a Christmas remake of Star Steps in mind, but now I have another idea kicking around in my brain. I wonder if there's enough fabric in there for both? The four hour drive home seemed longer than the drive down, probably due to the very heavy rain for the second half. However, that brought a gorgeous rainbow, so the day finished on a pleasant note. What did you do on Eclipse Day? Oh, I am so glad the clouds parted for you for at least a bit of totality! We drove 4 hours north to see it. Skies were clear and we enjoyed the whole thing. But you got to shop at quilt shops, too, and I didn't. We drove a few miles out of our way after the eclipse to find a shop, only to discover it had shut down. :( Then it took us 8 1/2 hours to get home, due to bumper to bumper traffic of all of the eclipse chasers trying to get home. But it was worth it. My daughters and I love Anne of Green Gables, too. I'll enjoy seeing what you create from those fabrics. Pretty fabrics and I'm sure they'll make a wonderful quilt, even if they're not your usual choices. And congrats on the recognition at MSQC! Super cool photo and a great story, even if the clouds didn't cooperate. (I watched the eclipse, catching it just right, on the NASA live stream, at work, as Michigan wasn't even close to totality!) I look forward to seeing what you create with your new goodies! We were very fortunate to be able to see the eclipse from our front yard. We sat out there in lounge chairs - well, my next door neighbor (and partner in crime AKA quilting, shopping, etc.) did, while DH sat in a different lawn chair. Most neighbors were there with company except the ones working. It was AMAZING!!! So sorry you missed it. Our youngest son, who just moved to Kansas City, KS area had the same problem. The clouds came in 10 minutes before the totality and left about 10 minutes after. Most other relatives lived elsewhere and could only see the partial eclipse. I rarely buy pre-cuts either, except the occasional charm pack. Kind of funny that the fabric cutter seemed a tad bit annoyed at the 1/4 yard cuts! The fabrics look lovely. We made a long weekend out of eclipse day and traveled to see the total eclipse in Western Kentucky. It was amazing! We were lucky to have good weather. 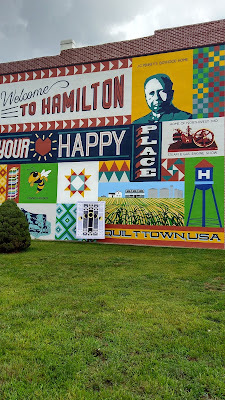 We also fit in stops at Hancock's of Paducah, Quilt in a Day in Paducah, The National Quilt Museum and Whittle's Fabrics in Smith Grove KY. Also did some mountain biking in a state park. All in all, a big success. What a fabulous trip you had. except for the rain. I would love to visit Missouri Star. In spite of the fact that everything didn't turn out exactly as you would have wished, it seems you had a good time and came home with some goodies. I "observed" the eclipse event, but there really was a very slight change in the way things looked here. 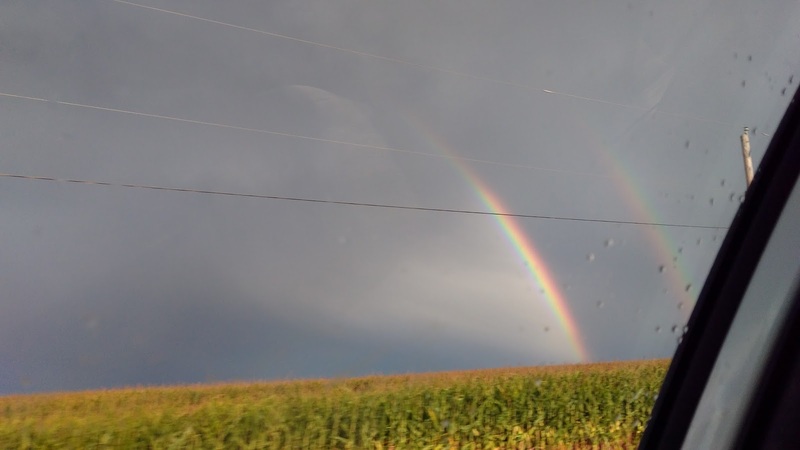 It was a bright sunny day, and we just weren't in the right place for a dramatic change. But I enjoyed watching it on TV anyway. ---"Love"
What a shame the clouds and rain spoiled your view of the eclipse especially for an astronomer. Mind you the visit to Missouri Quilt Co would be my preference. Lucky girl and you bought lovely fabrics. Your purchases at MSQC look super fun! In New Mexico, we started with a totally overcast morning, so didn't expect much and we only had about 75% coverage expected anyway. As the morning wore on, we could see blue sky out to the west,so decided to head out to lunch and see what we could. 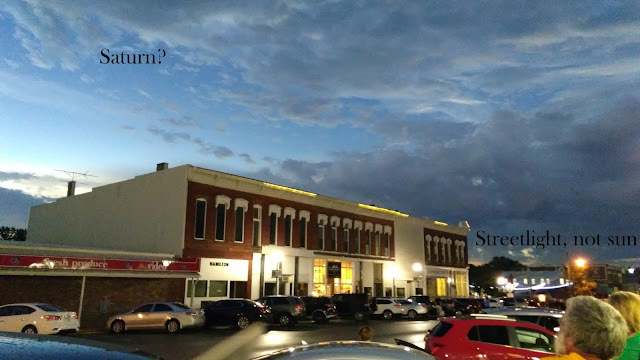 When we were part way, the clouds were closing in again to the west so we decided to stay in town instead. It was still cloudy but the clouds would part for little bits of a look. At the time of totality we were headed back home but were able to pull into a parking lot for a look at the height of our partial eclipse. It was so interesting, I would have loved to see the total eclipse. Your new fabrics are so pretty. When I visited Missouri Star, I found it overwhelming. So many pretty things to see. It was hard to decide which pieces to buy. Sounds like a great trip! OH, your eclipse quilt is so stunning, I'm sure it was a big hit while you were there. In spite of the clouds, it sounded like you enjoyed the trip - what an event! I have heard of a lot of people travelling quite a few miles to see the eclipse. Nice bit of shopping, and your quilt looks great there on the wall! I stayed in the house until I noticed the light change. Then I went outside and photographed the driveway under a couple trees. The leaves really did act like a pinhole camera and created little crescent shapes of light on the driveway. Sounds like quite a trip! I'm anxious to see your Anne quilt. I'm a fan as well but I have no daughters - just sons and grandsons. 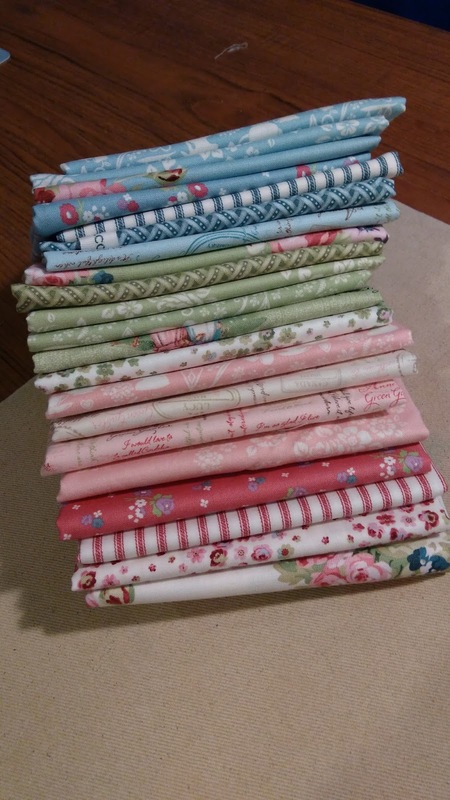 I have a fat quarter bundle of these fabrics but I haven't decided what to make with them. Eclipse Sky made its debut!